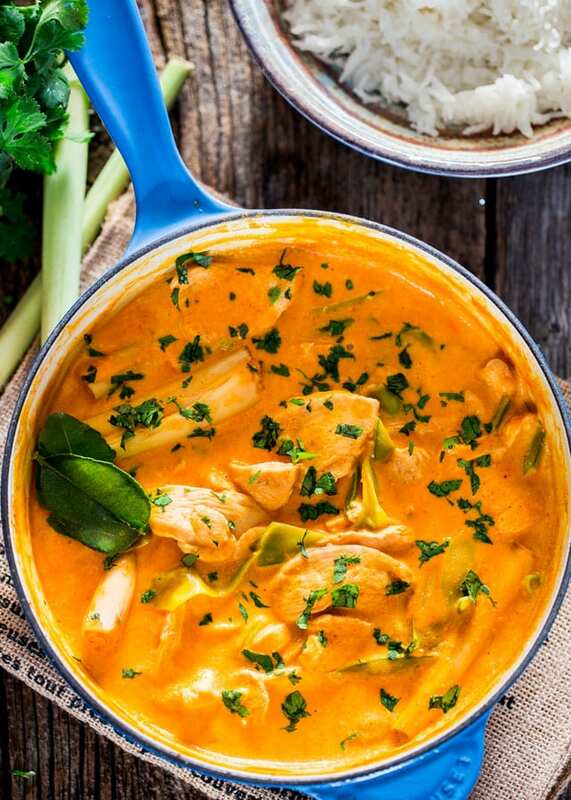 This Thai Red Chicken Curry is incredibly delicious, so easy to make with bite size chicken pieces, snow peas and simmered in a red curry and coconut milk sauce. 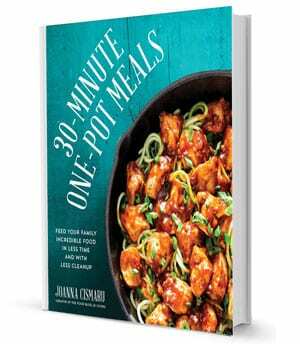 Thai cooking in under 30 minutes and all in one pot! My love for Thai food knows no bounds. It’s a love affair that started over 20 years ago and have never looked back since. My biggest challenge has always been to make it myself at home, but I’ve discovered a few years ago that Thai food really isn’t very complicated. 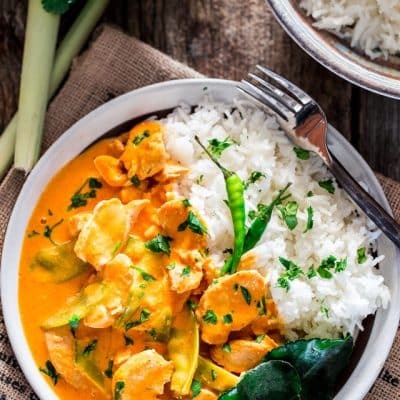 I especially love all coconut curries and with a few ingredients you can have quality Thai restaurant meals right in your home, made by you nonetheless. 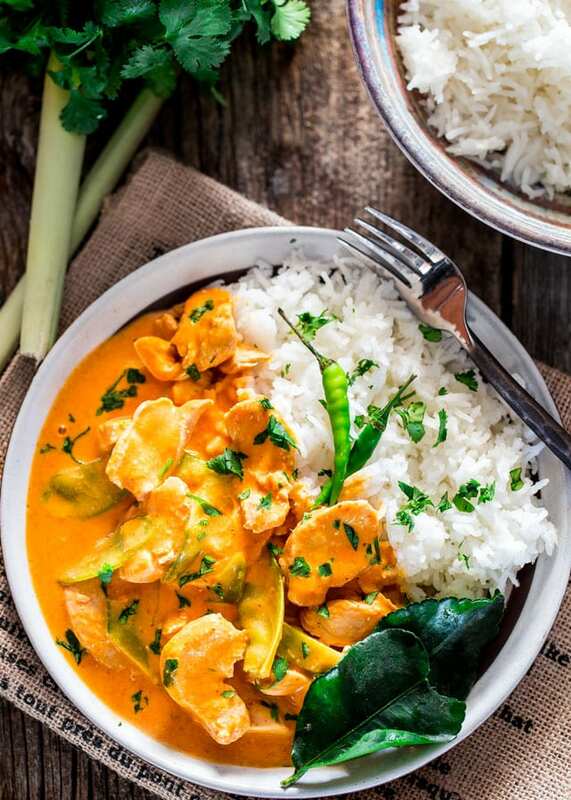 There are a few ingredients you’ll need to ensure you get the most flavor out of this curry; coconut milk, Thai red curry paste, kaffir lime leaves and lemongrass. 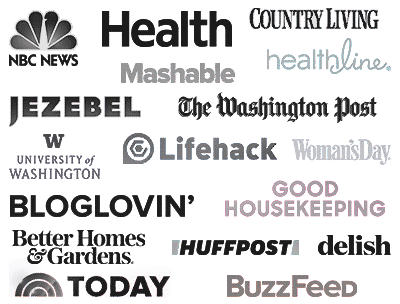 I can find them all at my local grocery store, but I’ve provided you with links on the ingredients to get the products on amazon if you cannot find any of these items. I also find the kaffir lime leaves at the farmer’s market. Kaffir lime leaves are a member of the citrus family and they give off a lime-lemon aroma and flavor. They really are an indispensable part of Thai cooking, as well as Indonesian cooking. There’s a little Indonesian kiosk at my local farmer’s market and I eat there almost every chance I get. Their food is so nicely fragrant and delicious. One day I asked them what gives off that nice lemony flavor and they told me all about these Kaffir lime leaves. They’re amazing, however, if you cannot find them anywhere just go ahead and skip them in the recipe. The lemongrass stalks also have a citrus flavor and again they are often used in curries. This dish is so great, you literally only need about 20 minutes to make and you will be so happy you made this. Start by cooking the chicken first with the garlic and ginger first in a large skillet. Once the chicken is cooked, all you have to do is add the rest of the ingredients to the pot. Simply simmer for another 10 minutes and you’re ready to eat. The flavors are out of this world, a creamy sauce which packs some heat from the curry paste, the more curry paste the better, it’s really not that spicy. I used 4 tbsp in this recipe and it flavored the dish nicely giving it just a bit of a spicy kick. For 20 minutes of total time you cannot beat this dish, delicious Thai flavors, not to mention your house will smell incredible. Heat the olive oil in a Dutch Oven or a large wok or skillet until hot. Add the garlic and ginger and stir-fry for about 30 seconds over high heat, until it gets aromatic. Turn the heat down to medium-high and add the chicken pieces to the pot and cook for about 4 to 5 minutes until the chicken is no longer pink. Stir in the coconut milk, curry paste, chicken broth, snow peas, kaffir lime leaves, sugar and lemon grass. Bring to a boil, then turn the heat down and simmer for another 10 minutes. Remove the kaffir lime leaves and lemon grass from the pot. Remove from heat and garnish with fresh cilantro. *To bruise the lemongrass, use a meat mallet or the back of a knife to lightly crush it. This will ensure you get the most flavor into your curry. You can leave the kaffir lime leaves and lemon grass stalks in the dish, and just push them to the side of your plate when eating, since they are too tough to eat. You can store remaining kaffir lime leaves in the refrigerator for at least 2 weeks. You can also freeze them in a sealed ziploc bag or airtight container. Nutritional information does not include cooked rice. I have made this recipe twice: once using chicken and the second substituting shrimp. Delicious and so good over some white rice. To anyone saying it was too watery, you could cut down on the chicken broth. What I did was mix an equivalent amout of chicken bullion into the coconut milk, and add any water only as needed. I also found that there is a difference between low fat coconut milk and regular. Regular much less watery. Finally, if you feel the need, just add a bit of corn starch (mixing with cool water first of course) to create a bit of a thickness to the sauce. The delicious flavor of this dish can not be beat. Already looking forward to making again! VERY good. My new fav chicken curry recipe. Thanks so much for sharing! This is the first meal I’ve ever made with Red Thai Curry Paste. Every one of my four kids and my husband and I loved it!!! Thanks for the simple yet delicious intro to homemade Thai! This is delicious, a great and easy recipe! I agree with other comments about it being too liquidy. I would use half or three quarters of a can of coconut milk instead of the full can. Also, in my opinion, two tbsp of red curry didn’t give it enough flavor so I went for four tbsp and it was perfect! Thanks for this awesome recipe. I made this recipe about a year ago, today I felt daring and instead of chicken I put portobello mushrooms and it did change the flavor but still tasted amazing! This is a really good recipe that can be added with lots of veggies or shrimp. Why is there 84 mg saturated fat? Isn’t this snunhealthy for 1 serving? 84 mg is actually 0.084 g. There are 1000 mg in 1 gram. This was such an easy and delicious recipe! My husband loved it. I’m always on line looking for a good recipe and usually no matter how many stars, the meal never turns out as they say on the reviews! So happy to say this one was first one to actually meet and exceed expectations! I did use some of the suggestions from some people in the comments, such as fish sauce and I did add a tsp of cornstarch it did thicken the sauce up a bit. I would think it may thin out because of the chicken juices from the beginning when you’re first cooking the chicken, Anyway regardless it was amazing! Thanks for sharing! I never post comments but this had to be said oh and I’m like a beginner cook with no hope of ever getting better and I still managed to make this recipe!!! The flavors in this are perfect. Really authentic, absolutely delicious. One comment though: the consistency is a lot more thin / watery than the pictures suggest in the recipe. I was looking for a proper curry consistency; instead, when ladelled on top of rice, I found almost 100% of the curry was absorbed, leaving just the chicken and snowpeas stranded on top of the rice. Still tasty, but not like you get in the restaurants etc. 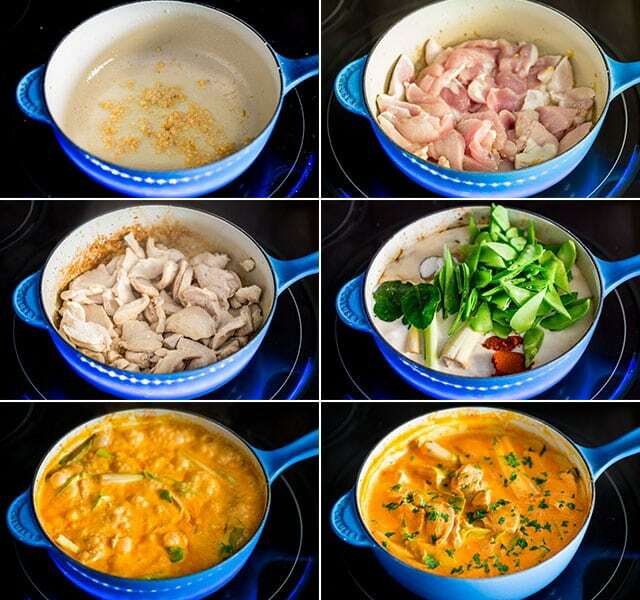 There should be plenty of curry because you are adding 3/4 cup chicken broth and a can of coconut milk. The only thing I can think of you cooked it too long and all the liquid evaporated. I don’t mean it as a criticism – it was just thinner / more watery than expected. There was a lot of ‘juice’, it just retained the consistency of the broth rather than something thicker. It was still absolutely delicious though! Didn’t take it as criticism, was just trying to guess as to why yours turned out the way it did. Glad you liked it still. I also found it to be thin, and I believe it was excess water from the chicken. I did add some ultra gel (similar to corn starch) and it thickened up the sauce a lot better to put over the rice instead of absorbing it. Wonderful recipe! Thank you! I used Kaffir Lime Zest instead of leaves, and added two-three Tablespoons of Thai Fish sauce. Also used Two types of Thai Eggplants (the ones that look like Peas) along with some Bell pepper and just a few Green beans instead of snow peas. I also added some Thai Basil. I think this was the most important item for me. But the rest was so Easy and the Taste was So Good. I lived in Thailand for two years and this is one of the best dishes I have ever made. So authentic and the flavor is so delicious….I will make this over and over…..
How essential are the lime leaves and lemongrass? I want to make this but I’m pretty sure I won’t be able to get those at any grocery store in my area. I want to tell you they’re not, but they really give the dish that Thai flavor, I’d say they’re pretty essential. I can usually find lemongrass in my local grocery store and lime leaves at the farmer’s market. Also if you have an Asian market in your area, you will find all those ingredients there. Red curry is always a favorite of mine! Very yummy!! I like to add veggies like onions, colored bell peppers and frozen peas! very versatile! This was really delicious. I added an extra garlic clove, lime leaf, and added mushrooms to it. Thank you for such a delicious recipe I do add more curry paste as I like it hot hot but otherwise the flavours all worked well together. The entire family loved it and it took us back to Thailand. Cant wait to try out some other recipes from your site. This line is vague. Are you saying to cut the chicken breasts into 1 oz pieces. Then should the next line read can coconut milk 13.5 oz. Sorry about that, been changing my recipe plugin and some recipes don’t translate properly, all fixed now. This was so easy and so good . You don’t use fish sauce? The recipe looks amazing but I’ve always found fish sauce indespensible in thai curry. Or did you substitute something for it? I absolutely LOVE Thai curries! I really love the addition of kaffir lime leaves in here! It’s such a wonderful flavour! I don’t know if I am missing it but where in the process does the Curry paste come in play? ?